A special request from another friend for a wobbling gnome desk decor. Using the many of the same elements from the pink gnome with her mushroom home, here is a Celtic gnome with a wee mushroom home. Once again, the gnome (4″) and mushroom (5″) are from Curt Jensen’s digital cartridge (Gnomes and Mushrooms). 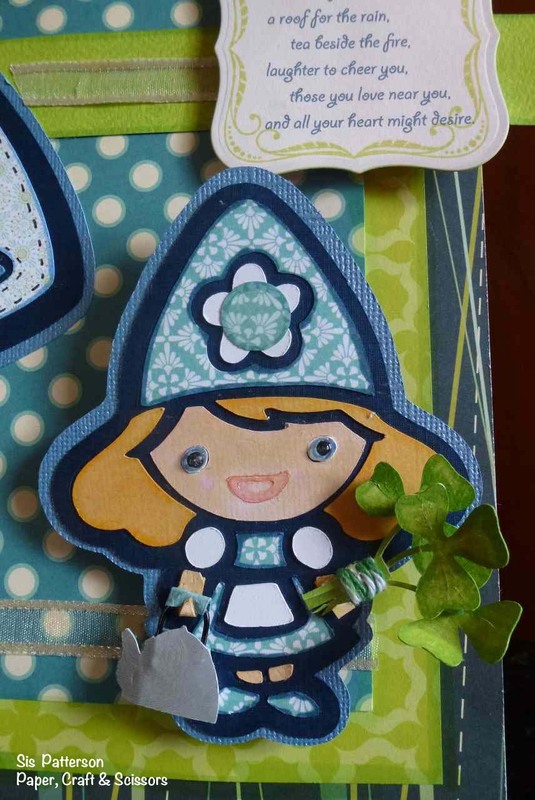 Her 1″ shamrocks are from A Child’s Year and her tiny tea kettle (.75″) is from Wall Decor. I trimmed off the kettle handle as it was too long and replaced it with a wired handle. I attached the gnome arms from the cartridge and used them as a guide to attach the longer (hand cut) arms that hold her bouquet and kettle. She wobbles delightfully and I’m sure she will keep it up during many a conference call. The sentiment, an old Irish blessing, was printed on Papertrey Ink Vintage Cream, and die cut with Spellbinders Label #4. The wonderful stamp frame is from Waltzing Mouse Stamps (Memento Ink Pear). This is adorable, Sis! I love the little teakettle with its wire handle. I have to laugh at your image of wobbling gnomes during a conference call…is that what y’all do behind closed doors on those secret conference calls. 🙂 Have a great day. She’s so cheery! This is so sweet with the bouquet of shamrocks and the teapot! Love the lipgloss! Your desk decor concept is one of my favorites! I know your friend will love it! As always, your color choices are just perfect! You can craft like gnomebody else!